Does the following statement sound poetic, or is simply magical? On June 11, I won my record-breaking 11th World Series of Poker (WSOP) bracelet, which was promised — last year — to my 35-year-old sister, Molly, who was born Nov. 11 (11/11). I’ve given all 11 of my bracelets away to family members, except the main-event bracelet from 1989. In any case, I won event No. 15, which was a $1,500 buy-in no-limit Hold ’em event, with more than 2,600 players. Who says the pros can’t beat big fields? 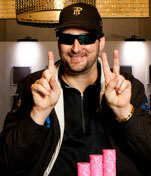 For 20 years, I have been chasing WSOP history, and now, finally, I have the biggest record in the game, 11 WSOP wins! Of course, Johnny Chan (10) and Doyle Brunson (10) may yet win a bracelet or two this year (the WSOP lasts through July 17) to tie or pass me (and you might not believe this, but I’m rooting for them). Naturally, I am also hoping that I can win another one or two bracelets. … By the way, the final table, with all of the hole cards shown (as well as every single hand), is available at the worldseriesofpoker.com Web site. Let’s discuss an interesting hand that came up at the final table when we were down to the last four players. With the blinds at $40,000-$80,000 and a $5,000-per-man ante, Morgan Machina (an old friend) moved all-in for $250,000 in the first position. Andy Philachack called on the button, and I looked down at 2-2 in the small blind. I decided to call, and Rick Fuller called in the big blind, after studying for a moment. Incidentally, it looked like Fuller wanted to reraise. The flop was A-J-3, and everyone checked. With Machina all-in, and no side pot, one thing was for sure: the three of us would not make a bet without a strong hand. I mean, why bluff out the other two, possibly keeping Machina alive, and possibly give him a $1 million pot in the process? The turn card was a nine, I checked, Fuller bet $100,000, Philachack moved all-in (for about $450,000), I folded, Fuller folded as well, but not before showing his hand, the A-6. Philachack now flipped up his Ad-7d, and Machina showed down Qc-6c. By the way, the last card was a deuce! First, here are a few facts: If I reraise before the flop, then I win the pot, bust Machina, and possibly bust Philachack as well. Second, if Fuller called Philachack’s $350,000 raise on the turn, then he would have lost because the deuce on the river meant that Philachack’s seven “kicker” played (aces with a jack, nine and seven). Third, if Morgan folds his hand, then a lot of interesting things may have happened. Let’s have a look at these possibilities. Most likely is that Philachack would have moved all-in for $750,000, and I would have folded, but who knows what Fuller would have done (probably folded). Or Philachack may have raised a smaller amount, and then I may have moved him all-in pre-flop, and possibly (if he calls) busted him. Or perhaps Philachack raises a small amount, I call, and then Fuller moves all-in and wins the pot. The crazy thing is that anyone of the three of us could have won that pot, if Morgan simply folded pre-flop! In poker, there are always tons of “what ifs,” but Machina didn’t fold, so let’s take it from there. By the way, because the last card was a deuce (and I could have busted some players), I took an extra long look at the way that I played this hand. Why didn’t I reraise with my 2-2 before the flop, especially when I had a huge chip lead? For the record, many pros would have reraised. Well, for one thing, if I drove everyone else out of the pot with a reraise, then Machina had to be at least even money to win the pot (there are not many hands that the 2-2 is a big favorite over). I love Machina, but I do not love anyone enough to protect them from elimination, especially when I’m going for the record! Another reason not to reraise is that I could always make trip deuces and bust multiple players. In fact, if the deuce had hit the board earlier, then I would have busted Philachack. What it boils down to is this: It just isn’t the right hand to reraise with in this spot, period. Upgrade the hand a bit, like make it pocket sevens, and then I probably would have reraised. It is the first year that a tournament is being broadcast on the Internet “live” (actually a one-hour delay) at the WSOP. It was the first year that the players — and one guest — are sequestered. Welcome to the future of poker! It was an incredible day for me, and I was pleased to see my win made Sports Centers top 10 plays (No. 9) on Tuesday night. Of course, even after I won I began to think of winning bracelet number 12.